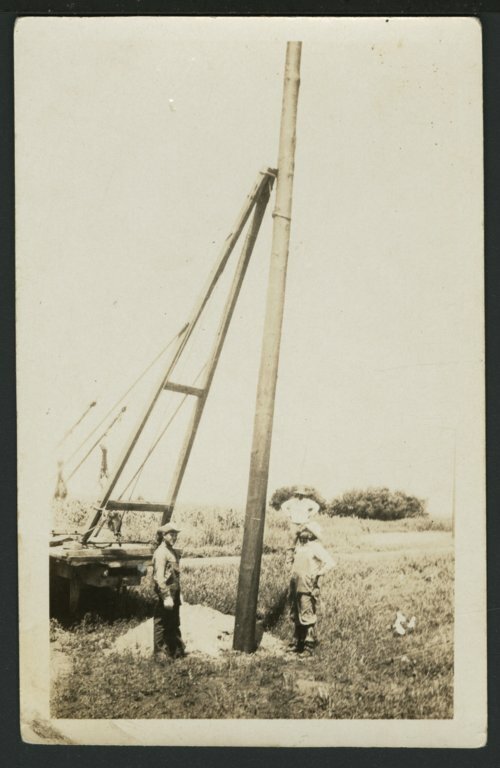 This is a photograph of Bill Burgress (left), contractor, watching an electric pole for DS&O Electric Cooperative being set near Solomon, Kansas. DS&O Electric Cooperative was established during the Great Depression as part of the federal recovery effort to bring the advantages and economic stimulus of electric power to rural Kansas. In 1991, Smoky Valley Electric Cooperative in Lindsborg, Kansas, merged with DS&O, adding to the Cooperative's coverage area and member base. It was named DS&O because members were from Dickinson, Saline, and Ottawa counties.